When you are feeling well, it can seem like a waste of time to go to the doctor. However, even when you’re feeling healthy, getting an annual physical exam can help ensure you stay in good health for years to come. We’ve gathered some of the many benefits you stand to gain by making annual physical exams a priority for you and your family. To schedule a physical exam today, call us at Chicagoland Complete Healthcare. Whether you’re already healthy and want to stay on track or you’re making a concerted effort to improve your health, it’s important to know where you’re starting from. 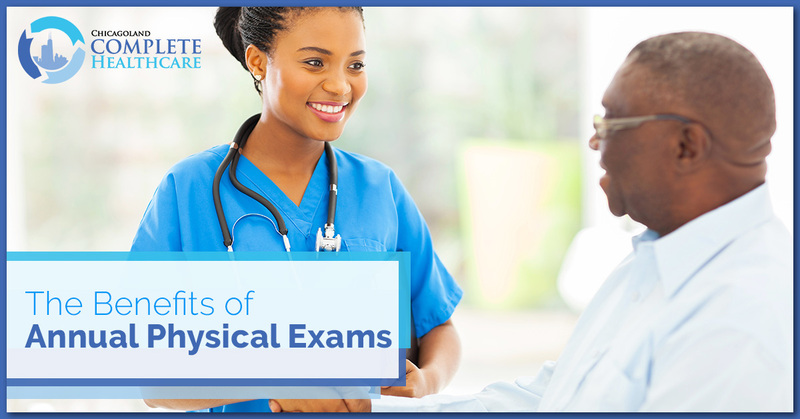 After your first physical exam, you will be provided with vital statistics that tell you exactly what you can improve on and what is already working well. Without this information, it’s incredibly difficult to live a healthy life, as everything you do will be purely based off speculation. Don’t rely on guesswork when a physical exam can give you hard data. Your doctor will measure everything from your weight and height to your blood pressure and cholesterol to gain an understanding of your overall health, which will allow them to provide specified treatment options to improve your quality of life. When your doctor gains an understanding of your overall health and habits, they will be able to properly help you make healthy life decisions moving forward. For instance, if you are a tobacco smoker, your doctor will be able to monitor for complications associated with smoking, along with providing you with options to quit. That can mean anything from medication like the anti-nicotine patch to finding therapeutic options to tackle the issue mentally. Your doctor is a fantastic resource for information about living a healthy lifestyle, so it’s a great idea to ask them specific questions regarding issues you may be experiencing. They will be able to give you advice about starting a nutritional diet, a fitness regimen that is catered to your needs, and any supplements you may need to make up for deficiencies. It’s recommended when you go in for your first annual physical exam, especially with a new doctor, that you know as much about the diseases prevalent in your family history. This information is critical to help avoid genetic issues you’re at risk of later in life, as well as providing information about diseases you may be more predisposed to based on your family makeup. Your doctor will be able to take this information and on a yearly basis run tests to ensure your risks for a disease you may be predisposed to have not increased. With this data, your doctor will also be able to advise you on ways to steer clear of future heart disease, prevent cancer, and provide you with overall better treatment in the coming years. While adults may not require vaccinations at the same rate as children, they can still prove to be quite helpful at preventing dangerous health issues. For instance, an adult needs to receive a tetanus shot every 10 years, and it is recommended they get a flu shot once a year. When you are making regular visits to the doctor, they are able to keep track of your vaccination records and alert you when you’re due for a new one. It is imperative for parents of young children to ensure their little ones have been vaccinated against diseases they are at an increased risk of catching. When children are unvaccinated, they allow diseases to breed, spread, and build immunities to vaccines other children have been given. This is incredibly dangerous, as those diseases can mutate enough to infect adults as well. There are many benefits to getting annual physical exams. They promote better long-term health, help you make life choices to improve yourself, avoid diseases you may be genetically predisposed to, and provide a baseline level of health to improve upon. Whether you made a new year’s resolution to get healthier or you just want to touch base and see where you’re at, you should schedule a physical exam today. Here at Chicagoland Complete Healthcare, we have years of experience and knowledge that will help you lead your best life. We hope we can help you soon!